The following are the chances you get to see traditional band Tullamore perform in the Kansas City area through the 2010 St Patrick’s Day season. Friday, March 12th: Waxy O’Shea’s, Shawnee 8pm. No cover. For information, call (913) 631-1759. Preceded by The Three Dollar Band, and followed by Connacht Town. Also performing that night in the upper cellar is Bob Reeder. $5 cover. For more information, call (816) 640-5235. Sunday early-evening, March 14th: Waxy O’Shea’s, Shawnee, KS 5:30pm - 9:30pm. No cover. For information, call (913) 631-1759. Wednesday, March 17th, St Patrick’s Day: O’Malley’s Pub in Weston, noon - 3pm. Tullamore are followed by The Three Dollar Band and Ellis Island. And in the upper cellar is Bob Reeder. $5 cover. For more information, call (816) 640-5235. 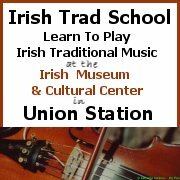 These events will all be added to the Kansas City Irish Events calendar. Well, except for the Emerald, KS gig maybe. This entry was posted on Friday, March 5th, 2010 at 2:23 pm and is filed under Events, O'Malley's Irish Pub, St Patrick's Day, Tullamore, Waxy O'Shea's Shawnee. You can follow responses via my RSS 2.0 feed. Both comments and pings are currently closed.